This newly renovated property features three lovely appointed bedrooms, two living rooms with open concept dining and two bathrooms. Tile through out with carpet in the bedrooms. The back yard is shared with another guest house. 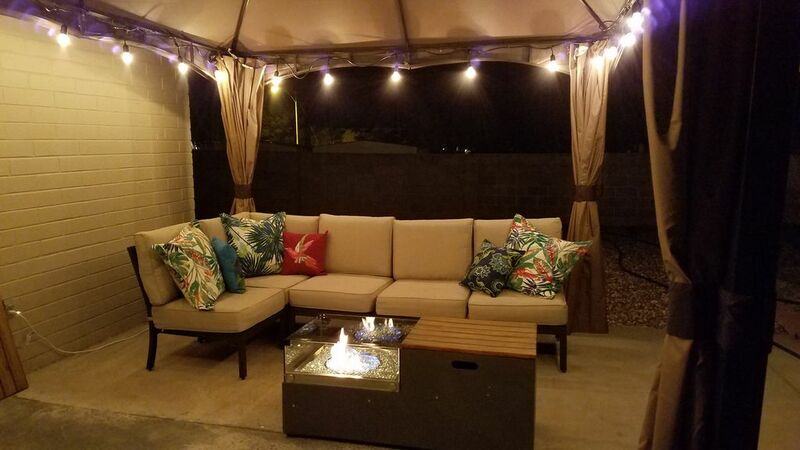 Patio features dining area, BBQ and Gazebo with gas fire pit. Ideal location for an extended stay, vacations and for visiting relatives. All the comforts of home and more! I love the hospitality industry. Previously owned and operated a Victorian B&B in Iowa for 15 years before moving to Arizona. Currently work as an Administrative Manager for a Behavioral Health Non- Profit. I'm married with 3 daughters. One is still at home. I have two lap dogs named Liza and Taqui. We have been hoping to expand our vacation rental business and found this lovely home close to ours that was freshly renovated with a modern and updated décor. This property is centrally located within Sierra Vista and only minutes from Fort Huachuca which is great for those visiting their military family stationed here. It is located close to many outdoor hiking opportunities as well as some famous site seeing possibilities like Tombstone. Off street parking available in the driveway. Large open dining room open to living room. Plus outside dining for 6. We are located just half an hour from tourist destinations like Tombstone and Bisbee as well as Kartchner Caverns State Park. I love hiking up to Coronado Cave just 20 minutes south, a nice easy and scenic hike for a family.